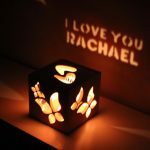 Check out: Perfect gift ideas to please your Girlfriend! 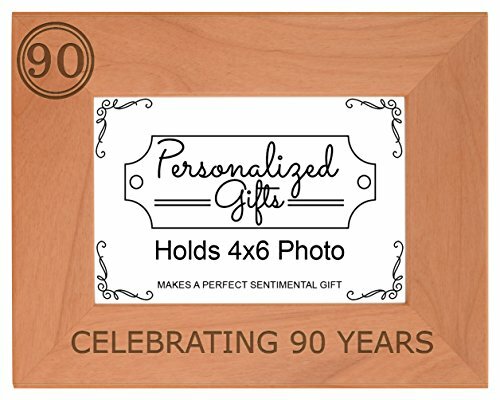 Looking for unique 90th birthday gifts? Check out our guide to the top 36 90th birthday gift ideas! A 90th birthday celebration is an amazing milestone to mark with a modest tribute or a wild blow-out. Gifting the birthday girl can pose a dilemma — 90-year-olds seldom need a whole lot, but they tend to be very appreciative. So put some thought into the perfect present for the nonagenarian in your life. She might be happily knitting in her wheelchair, or out running marathons, Skyping like mad with the grandchildren or great-grandchildren, or watching the bird feeder outside her window. Her interests and abilities should inspire your gift. Laughter is good for whatever ails you, so break out the humor, tailoring your fun to the well-being and personality of the nonagenarian. A T-shirt, coffee mug or canvas shopping bag with a custom design is easy to arrange. Try: 32, 871 days/788,923 hours/47,304,000 minutes…and counting! ; 1925, An Excellent Vintage; Not Everyone Looks This Fabulous at Ninety! ; Aged to Perfection; I’m the Boss! 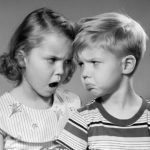 ; I’m Older Than You! Photo-shop her face onto a movie poster from a favorite classic flick — a Fred Astaire or Gene Kelly movie, Casablanca, Gone With the Wind, or It’s a Wonderful Life. Record all the descendants, especially the smallest ones, saying something they like about her. Edit it into a video; post the video on YouTube and play it at her party. Age is better than the alternative, but it does come with its petty irritants and diminished abilities. Give her luxurious but useful things that don’t add to clutter but provide plenty of pleasure. Scented body cream is soothing for dry skin. A beautiful tin of fancy cookies will last for many afternoon teas. A mani-pedi and lunch with you is a pampered day out — a trip to the hairdresser and an al fresco supper are good, too. Audio books give tired eyes a rest. A calendar with large, bold numbers and fonts makes it easy to keep track of days. Anyone over the age of 60 can find a use for a magnifying glass set. A beautiful warm shawl will get lots of use. And a grocery store gift card might be really welcome, if she still gets to shop. An orchid plant blooms for weeks and requires almost no care. Plant a tree in a nearby park in honor of the birthday girl — a gift to celebrate her life and grace the community for the next 90 years. Throw an old-fashioned picnic out-of-doors. Use the backyard if travel is too exhausting. Hire a string quartet or make a playlist of iconic music from her teenage and young adult years. Serve all of her favorite bite-sized treats and display a tiered dessert stand of delicate tea cakes instead of a sheet cake. Decorate a comfortable wicker chair for her with pillows, garlands and throws fit for a queen. Landscape her garden or help her plant a raised-bed vegetable patch. A new straw hat and a pair of gardening gloves will keep an intrepid active senior gardener out mucking about among her favorite plants. The 90-year-old you know may not be chomping at the bit to try a zipline in the rain forest — do look into that if she is. But taking care of a bit of unfinished business might be hilarious, risque, memorable or mind-altering, and put the icing on the cake of a 90th-birthday celebration. Book a girls’ night — or afternoon — out at a male revue club — a birthday rather than a bachelorette party. Pool extended family resources to send the birthday girl to a dreamed-of destination with a favorite grandchild — the Eiffel Tower, a Broadway musical, a flight over the Grand Canyon, an afternoon on Malibu Beach or Rodeo Drive, a whale-watching cruise. Pay for a weekly class to get her out of the house and mingling with like-minded souls, and then celebrate her new skills or knowledge at the birthday party. One family treated granny to a stand-up comedy class and staged a one-woman show with a fast-quipping 90-year-old star. 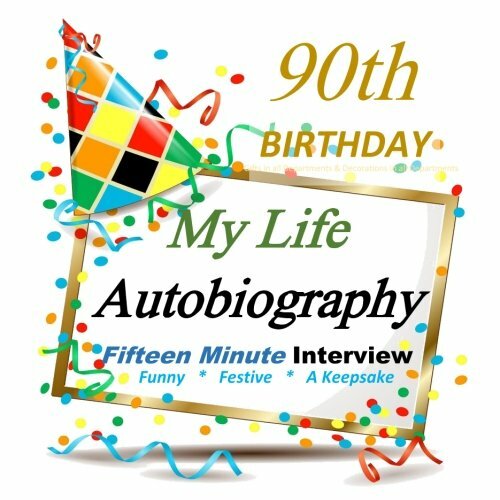 What Are Some Good Gifts for a 90-Year-Old? Suggestions for a 90-year-old’s gift include keepsakes from the person’s youth, such as a CD or DVD with a childhood song or movie that the person loved or an item of clothing embroidered with a few words commemorating the milestone year. The words can be sentimental or humorous, depending on the personality of the 90-year-old and his relationship to the person giving the gift. BirthdayGiftsandCelebrations.com recommends checking in, if possible, with the honoree to see if there is anything special that he needs or wants. Another idea is to cook a meal for the person. Many older people have dietary restrictions, so it’s important to be aware of the things they can and cannot eat before planning the meal. The meal can include special foods from the person’s past as well as current favorites. 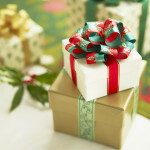 If the gift is being sent from a long distance, BirthdayGiftsandCelebrations.com recommends making a video recording of family members or friends who each say a few words about the honoree. An easy way to make such a video is to have each person record his own greeting and send it via the Internet to the person delivering the gift. The greetings can then be combined into one video and burned onto a DVD or CD to be handed to the recipient. 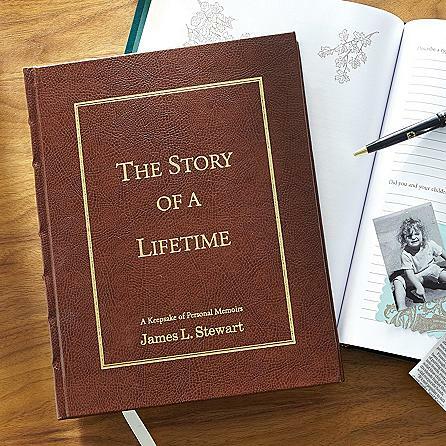 So much in life has changed over the course of 90 years, and this best-selling personalized book is the perfect way to flip through the pages of time. 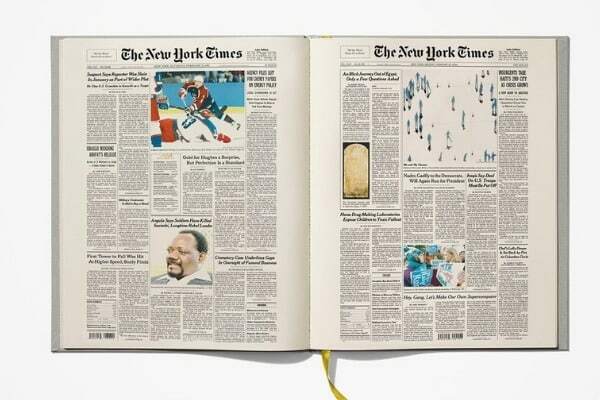 Striking book features every New York Times front page on the recipient’s birthday for their entire life – 90 years of front page headlines and news! 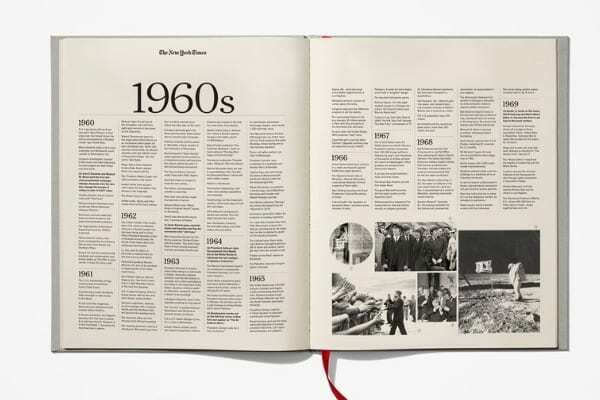 It also features an exclusive, 20 page photo-packed timeline that highlights the most important events of the 20th century. Filled with an impressive 140 pages, the gift also includes a magnifier and additional pages of world headline events. Memorable book is available in 7 colors in 2 cover styles. Prices start at $155. A thoughtful gift that’s sure to spark conversation and inspire memories! HOLIDAY SALE – SAVE 20%! Save 20% off full priced products at The New York Times Stores. Valid 11/29 – 12/3. 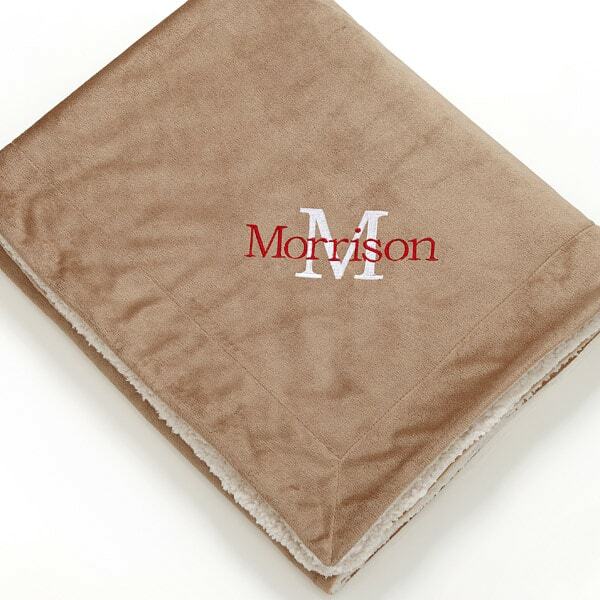 Keep your favorite senior warm during those chilly days with this super-soft personalized fleece blanket. 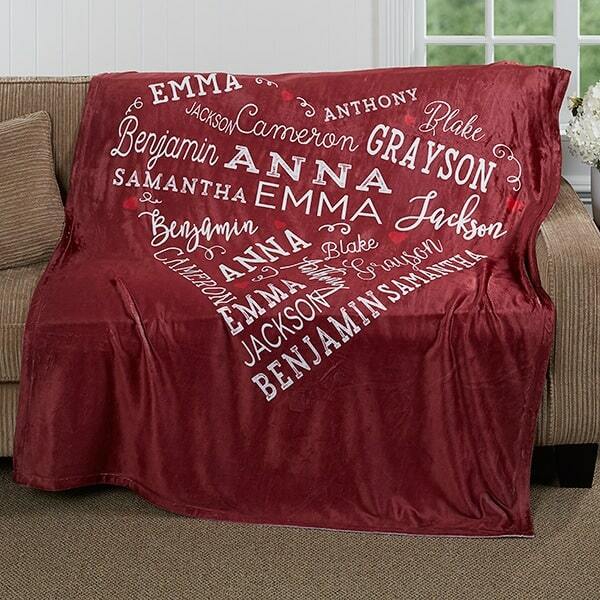 This cuddly, machine-washable blanket features the names of up to 21 children and grandchildren in a heart shape. The perfect weight for snuggling with a good book, watching TV or napping, the recipient will love being surrounded by the names of the ones he or she loves. Take $10 off any order over $50 at Personalization Mall. Unique Day You Were Born canvas print is personalized with the recipient’s name and birthdate at the top. The personalized canvas chronicles the headline news, top sports results, movies and songs of the day. It also features an interesting cost of living comparison – it’ll be amazing to see how much prices have changed over the years. Available in 3 sizes, it’s a fabulous gift for any hard-to-buy for senior! Piece together the headline events from the guest of honor’s birth date with this unique jigsaw puzzle. 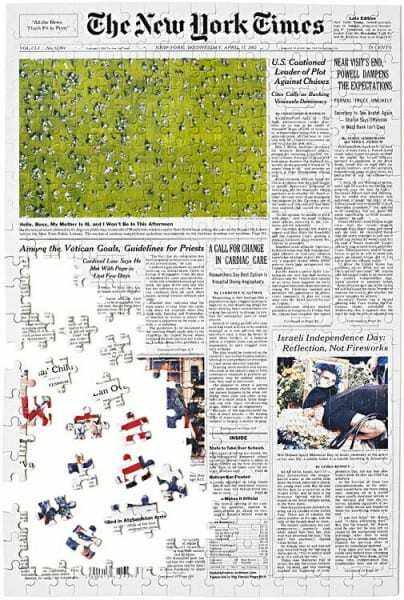 Available in 3 sizes, this puzzle is an exact replica of the New York Times for any requested date. It includes a paper reproduction of the front page to help while assembling the puzzle. A fun gift that will bring hours of enjoyment for the recipient, family and friends! CYBER MONDAY – Save 25%! Save 25% off full priced products at The New York Times Stores. Valid 11/25 – 11/28. Help the birthday man or woman preserve a lifetime of memories with this striking, leather-bound personalized journal. The book poses almost 500 questions that range from simple to the thought-provoking. Plenty of room to answer each question is provided on elegant, gold-tipped pages. The recipient will enjoy answering the questions, and knowing that his or her precious memories will be preserved for and enjoyed by future generations. You probably want to tread carefully here. Over the hill gifts aren’t really appropriate for a 90th birthday. 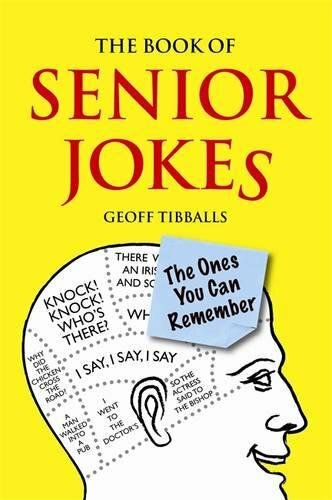 If you’d like to give a funny gift, a gentle sense of humor is really more appropriate for someone who’s turning 90. Each of these gift ideas is available in several designs. You can choose from a variety of gifts, including pins, stickers, mugs, shirts and more. Hopefully your favorite senior has a sense of humor about turning 90 years old! 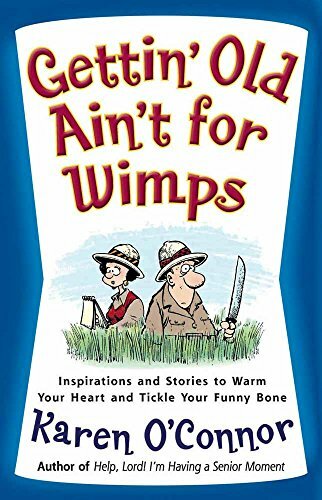 Hilarious book about growing older by Dr. Seuss is sure to make him or her laugh out loud! A whimsical and funny book for any “obsolete child”! Since birthdays grow sweeter with every passing year, a 90th birthday deserves something spectacular. 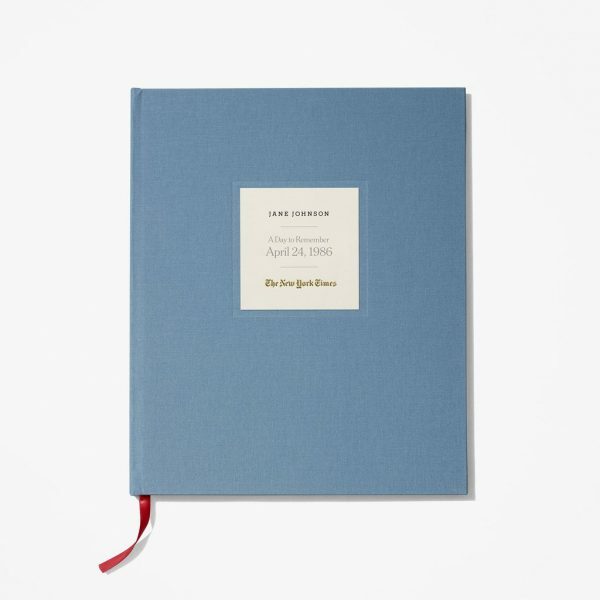 This exclusive gift features up to a complete reprint of The New York Times edition of they day they were born. With this personalized keepsake, book your loved one can learn more about their special day as they flip through the pages of history. Beautifully encased within a 12″ x 15″ portfolio that is personalized with their name and date of birth, it lets your celebrated senior know just how much you cherish them. You don’t have to spend a fortune to find a gift that will delight the recipient! Check out these inexpensive gifts that don’t look cheap. 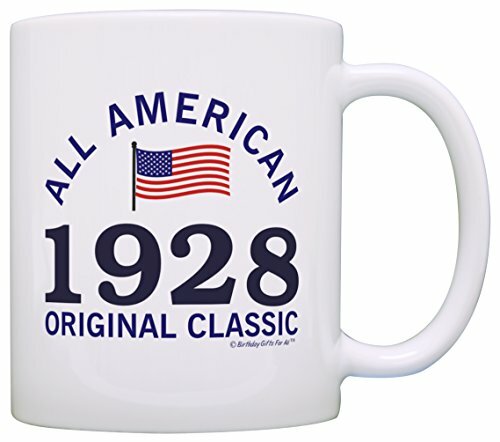 Anyone who’s celebrating 90 years probably needs a little extra jolt of caffeine to keep going! 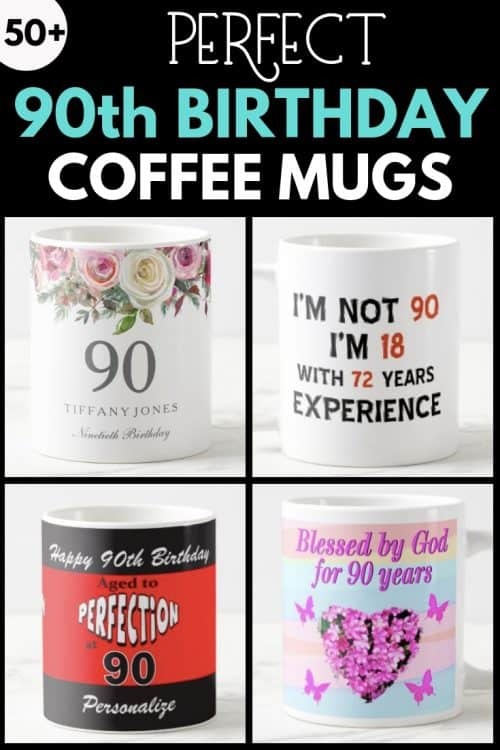 Zazzle offers a great selection of 90th birthday mugs in hundreds of different styles from cute to funny to personalized. 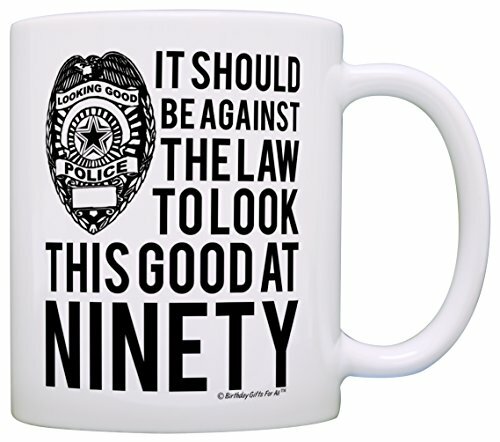 With prices starting at under $20, the mugs are great inexpensive gifts. You can give them by themselves, or add flavored coffees and other yummy treats to create a cute little gift basket. 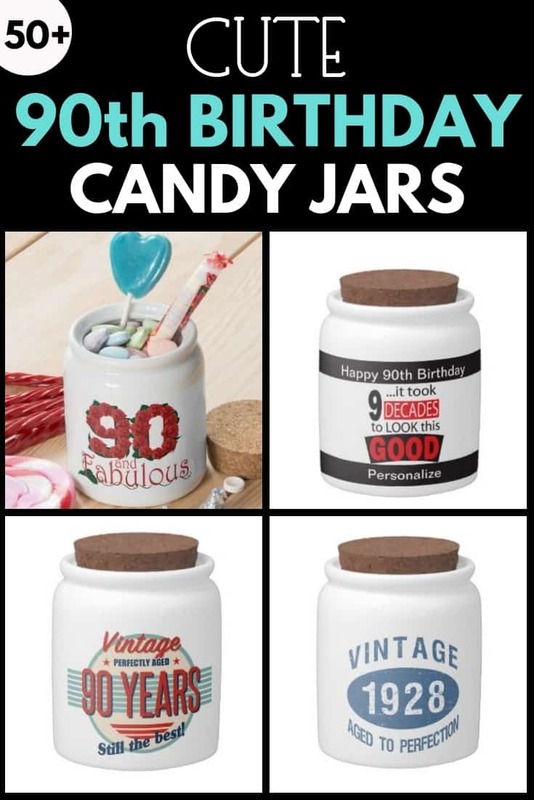 On their 90th birthday, shower your favorite senior with love by giving them a cute little candy jar that features an endearing 90th birthday design. Zazzle has a wonderful selection of tiny candy jars that are perfect for this milestone occasion. The jars start at around $20 – an inexpensive gift that is sure to delight. 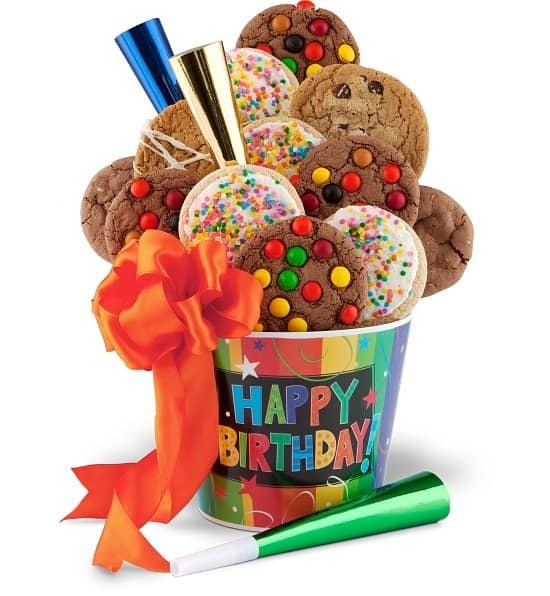 Fill it with their favorite treats to tickle their taste buds long after their birthday ends. 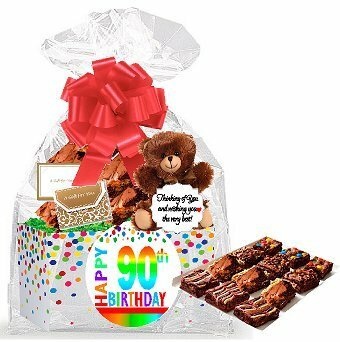 Send sweet birthday greetings to your favorite senior with a delightful 90th birthday gift basket! GiftTree is my top choice for impressive birthday ​gift baskets. 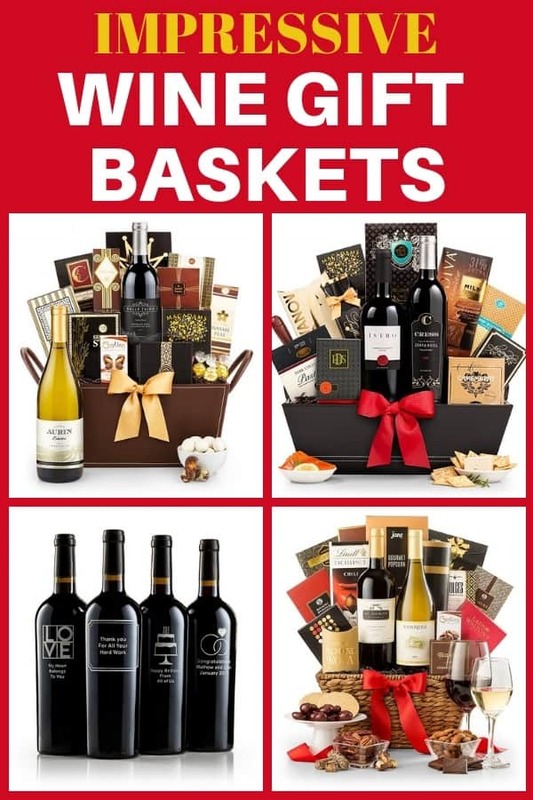 They offer an amazing range of gift baskets in all prices…starting at under $15! 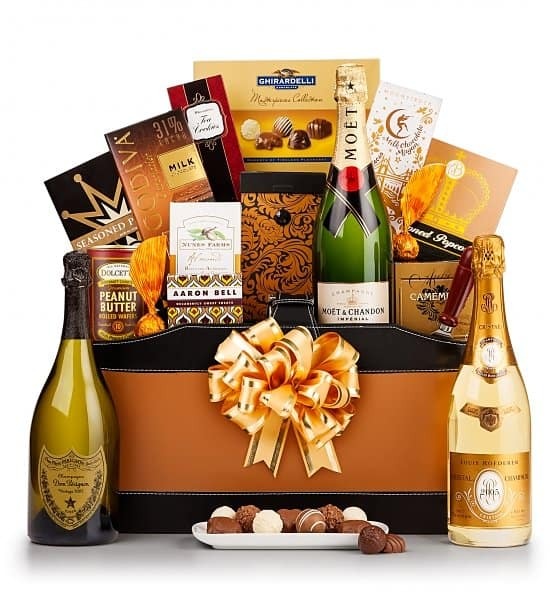 Or if you want to splurge, consider a luxurious champagne gift basket. You can even mark the occasion in style with an engraved bottle of G.H. Mugg champagne. The best part? You can choose to have a personalized satin ribbon imprinted with your own special birthday greetings if you’d like. For a gift that will truly brighten their day, this quality candle holder features a stunning finish that will complement any room. Unlike most candles that can only be reused a few times, this charming container holds a standard-sized tea light that can be replaced for years of use. With a sweet sentiment that reminds them of what life is all about, the birthday star is sure to feel the warmth both inside and out. Flowers are always a wonderful gift for any birthday! 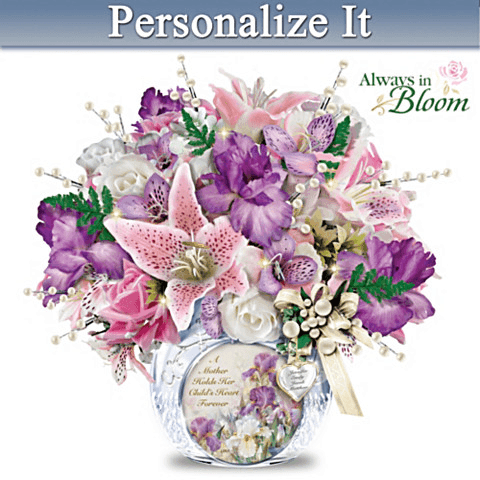 If you need a last minute gift, you can send 90th birthday flowers from FTD to arrive today. But for a special event such as a 90th birthday, it’s nice to think outside the box just a bit and send unique flowers. 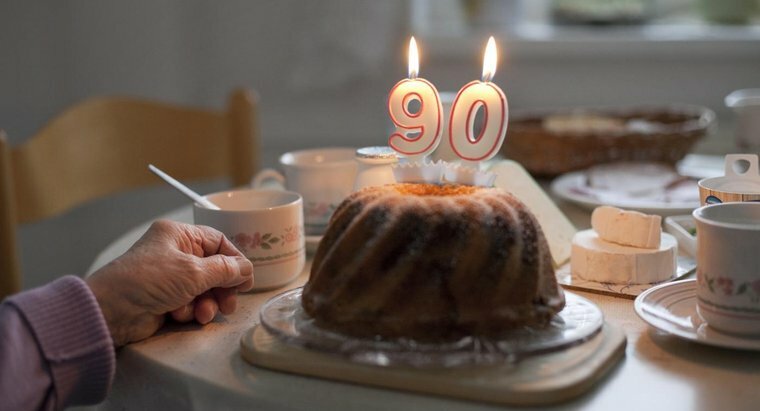 Here are some lovely ideas that any woman turning 90 will love! On this special occasion, think beyond traditional flower bouquets, and treat a special lady to a one-of-a-kind rose! A real rose is carefully preserved with enamel and then trimmed in 24k gold to create a gift that will last forever. A unique gift that can be enjoyed long after the special day is over! 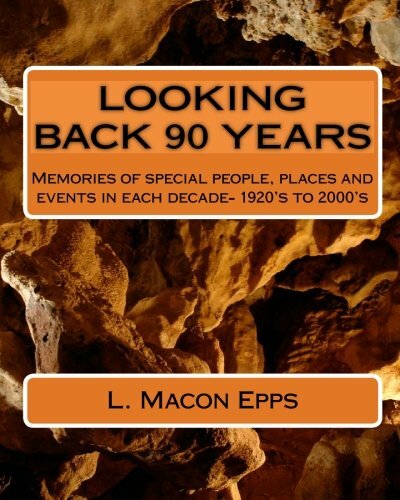 Looking for a sentimental 90th birthday gift for Mom? Brighten her day all year ’round with this gorgeous lighted floral centerpiece! The inscription reads, “A Mother Holds Her Child’s Heart Forever”. Each of the children’s names are engraved on the heart tag…a beautiful reminder of the ones she loves most! Any woman who is about to turn 90 has received her fair share of flowers. Chances are she’s never been sent flowers like this gorgeous arrangement! 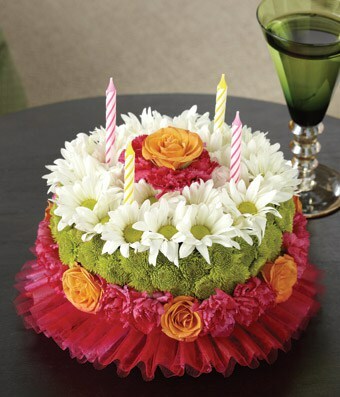 Colorful flowers are arranged in the shape of a beautiful birthday cake to create a unique gift that will awe the recipient. Need a last-minute gift? This can arrive on the same day! 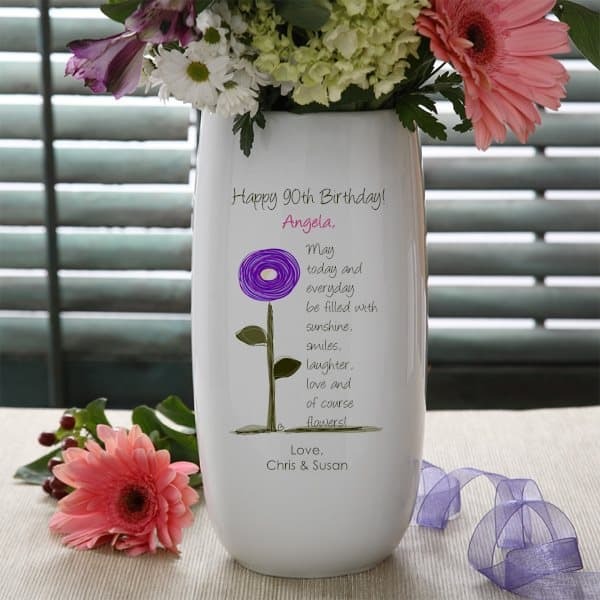 Give Mom, Grandma or another woman who is turning 90 flowers in her own personalized keepsake birthday vase! Personalize with the name and your own message. Then add her favorite flowers to create a gift that she can enjoy over and over. 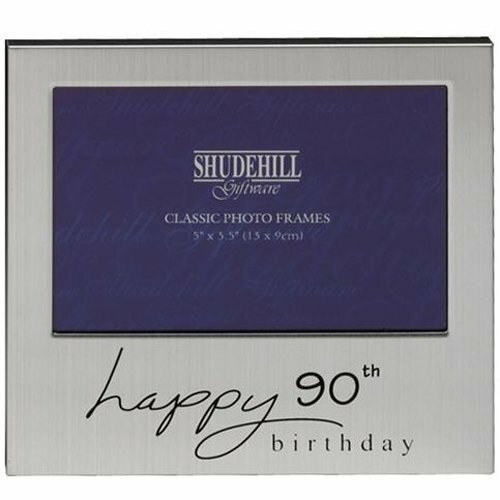 Showcase a favorite memory from the big day in this personalized 90th birthday frame! 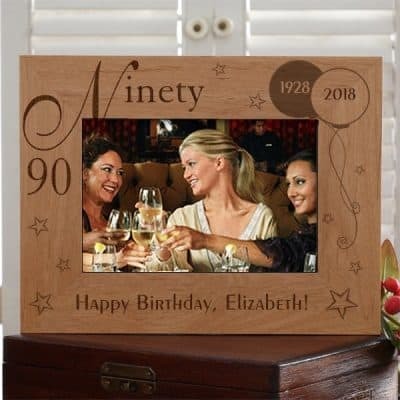 Available in your choice of 6 color schemes, the frame is personalized with name, birthday, current year, and the birth year. It also features 2 additional lines of personalization for nicknames or a special message. A great last minute gift – it can ship in just 1 or 2 days! 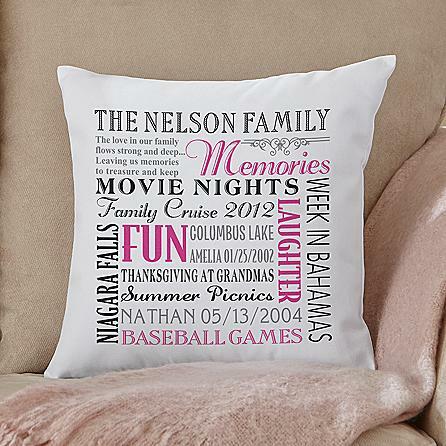 As a fun way to celebrate their big day, try a custom throw pillow to help them spruce up their space. Your design choices are endless, and many styles give you the option to add a photo, name or other means of customization. 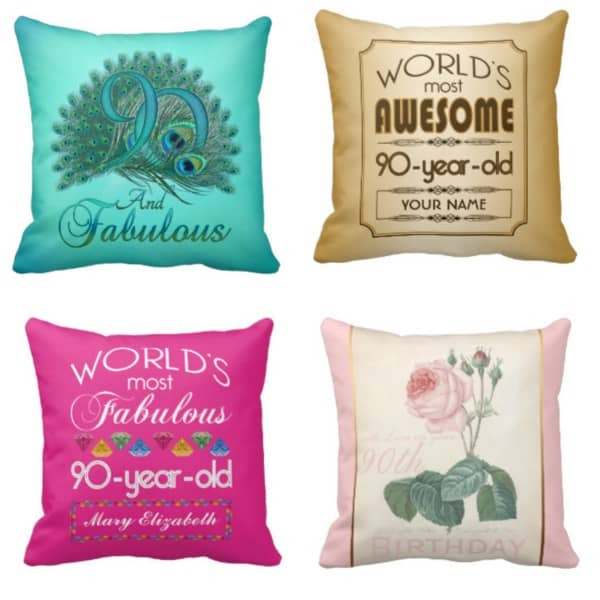 From humorous wording to meaningful expressions, each pillow features vibrantly colored designs on smooth, wrinkle-free fabrics for a high-end look that sends the right message. The birthday celebrant can show off his or her pride at turning 90 with a special birthday shirt. 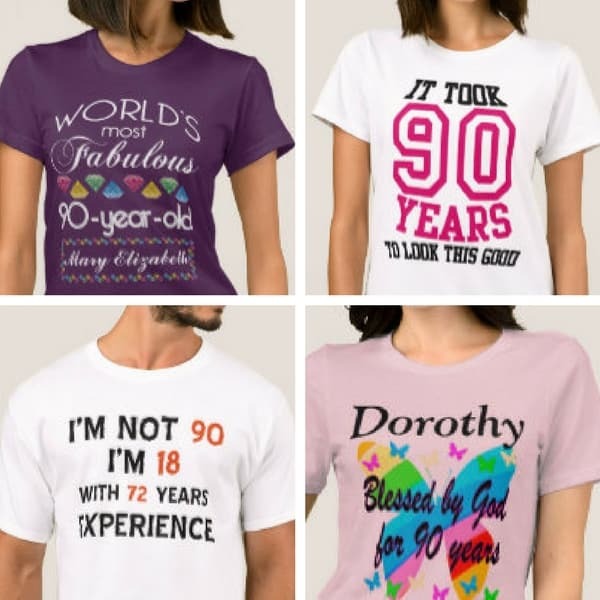 Zazzle has hundreds of 90th birthday shirts for men and women! Most of the shirts come in a variety of styles and colors, so just click on the design you want to see the details. 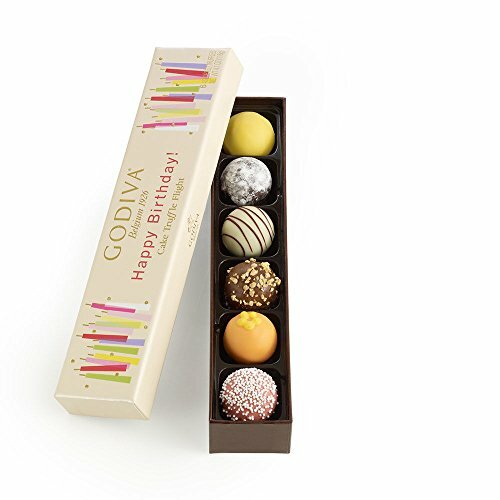 While you can never go wrong with a box of chocolates, this special set is beautifully packaged within a personalized box to make a sweet gift even sweeter! 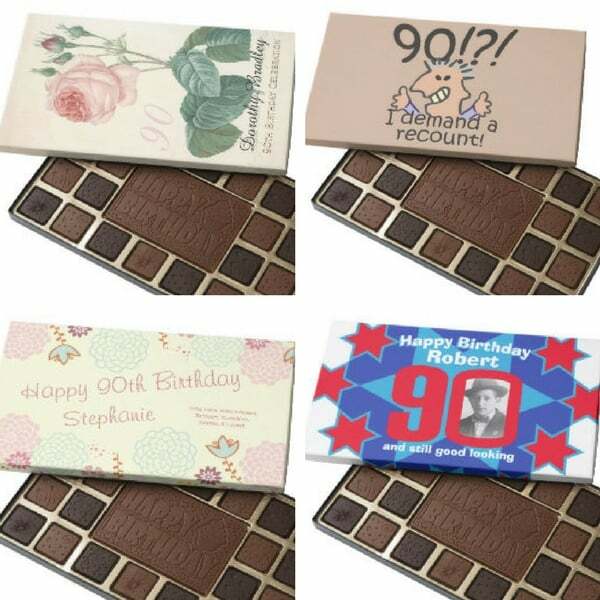 Choose from a delicious selection of 45 assorted chocolates or a solid 2-pound bar, and you can add your personal touch by choosing from over 40 unique designs to be engraved on their delicious surfaces. Capture all the excitement and fun of their big day in this handsome personalized photo album. The guest of honor’s name and special birthday will be laser-engraved on the cover of this wooden album. Inside, you can add up to 72 pictures. The perfect way to enjoy the celebration long after the big day has come and gone. 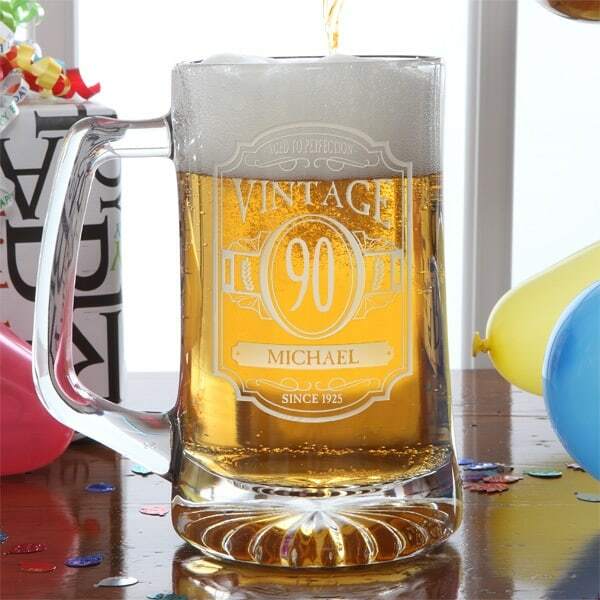 At 90, he’s earned the right to a few ice-cold, frosty beers – and this striking personalized mug will allow him to enjoy his favorite beverage in style! 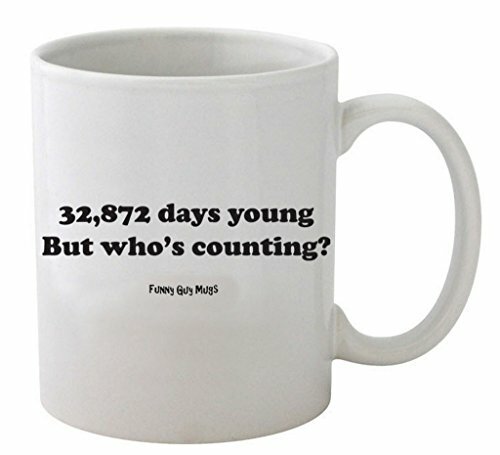 Sturdy glass mug features his age and 2 lines of personalization. The phrase “Aged to Perfection” appears at the top of the etching. The perfect 90th birthday gift for Dad, Grandpa, or any beer-loving man! 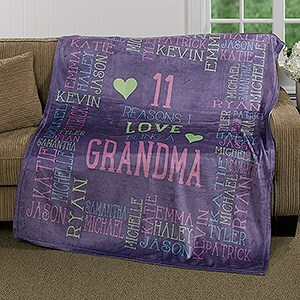 Your favorite 90-year-old will love the soft and cozy feel of this delightful personalized blanket! The warm but lightweight blanket features micro-mink on one side, while the inside features a snuggly, faux lambswool sherpa. The machine wash & dry blanket is available in grey or tan, and can be personalized in your choice of thread colors. A special occasion like this certainly deserves a toast or two. This prestigious champagne gift basket provides all the goodies you want for a memorable celebration! Your choice of premium champagne is paired with award-winning snacks and delicacies, all arranged in an elegant leather container. Add a personalized message on a silver hang tang for an elegant touch. A gift that’s sure to impress! If your favorite senior loves the vintage look, then this beveled glass jewelry box is sure to be a treasure. It can be personalized with a loving message and any 2-line closing sentiment. 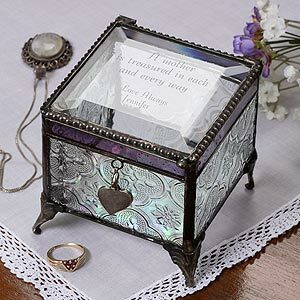 The elegant silver-plate trim, intricate filigree and dangling heart charm make this box a worthy container for her most prized possessions, but its true riches are found within your custom-engraved words that she will adore for years to come. A thoughtful 90th birthday gift for Grandma, Mom, or any special lady! 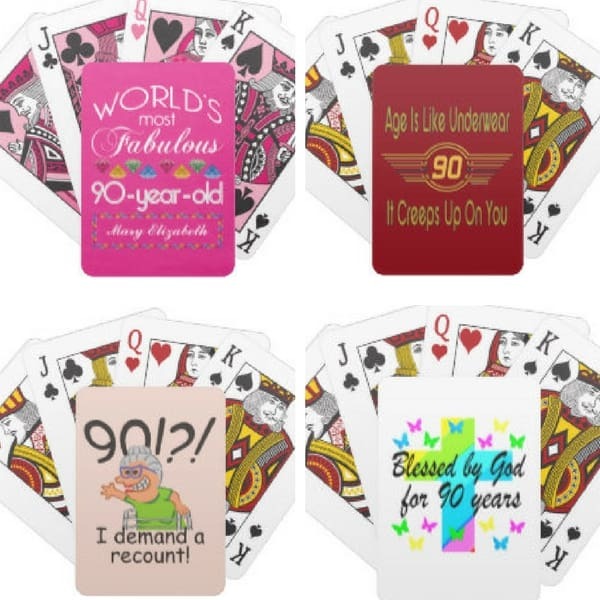 At 90 years old, your loved one has earned the right to relax and enjoy life through their favorite pastimes, and a new deck of playing cards is the perfect way to encourage their play. These cards can be customized with a wide variety of designs that include photos and personalized text. Impress a special man or woman who is turning 90 with a 90th birthday wine gift basket! GiftTree has a fabulous selection of wine gifts that feature your choice of prestigious wine. You can even choose to have a bottle of wine engraved with a personalized Happy 90th Birthday message…or add the message to a personalized ribbon. Keep the birthday celebrant stylish and protected from the sun with a festive hat designed just for their birthday. 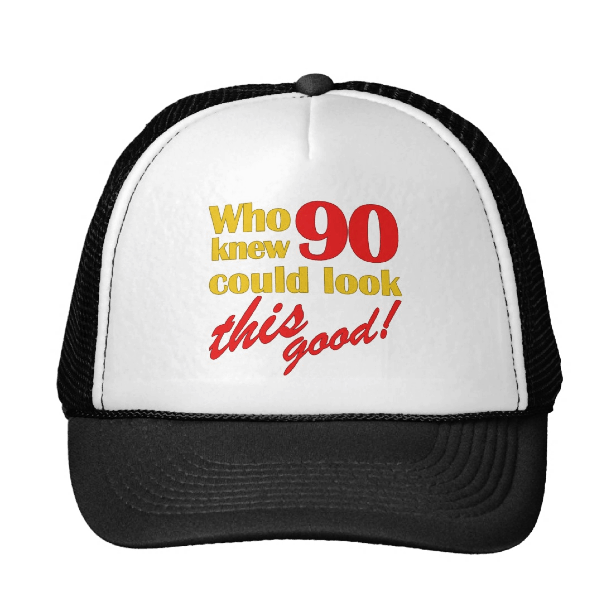 Zazzle offers over a huge selection of 90th birthday hats! Most of the designs are offered in several different colors – just click on the design you like to see the choices. If your loved one is hard to shop for, you can’t go wrong with catering to their taste buds. Striking 90th birthday gift basket is both healthy and delicious, arriving beautifully packaged within a French Country basket. Including Fuji apples, ripe pears, jam-filled cookies and more, it contains a variety of indulgent flavors to satisfy anyone’s craving. Each cookie comes individually wrapped to ensure peak freshness for enjoyment long after the party is over. This milestone birthday is a fabulous time to let your favorite senior know how much he or she has meant to you, and this sentimental keepsake gift is the perfect, long-lasting way to share your thoughts. 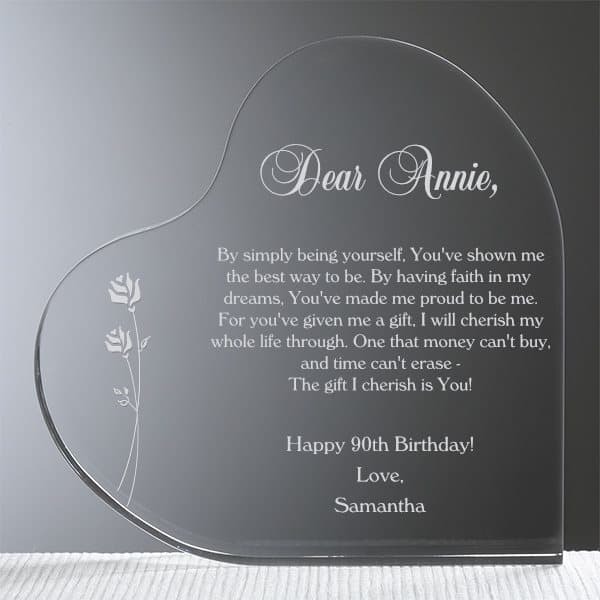 The clear lucite keepsake features your own loving message (or you can choose from pre-written verses) engraved in the center. 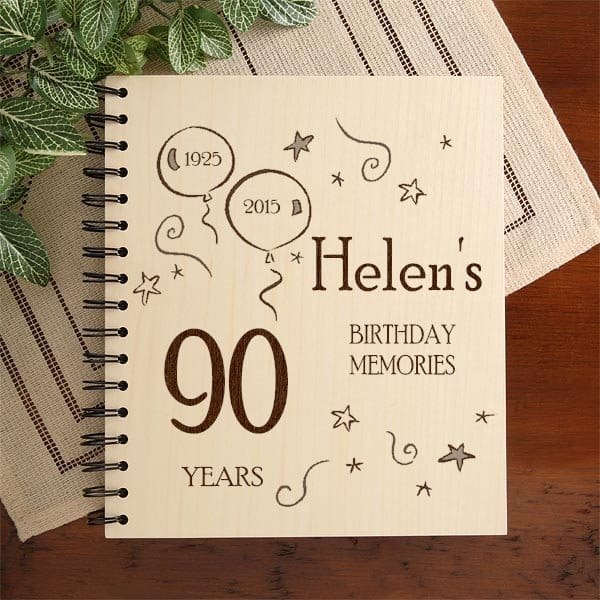 Add any title to the top, and a 3 line closing sentiment – the perfect place to engrave “Happy 90th Birthday”. A sentimental gift that they will treasure – don’t be surprised if he or she cries tears of joy! 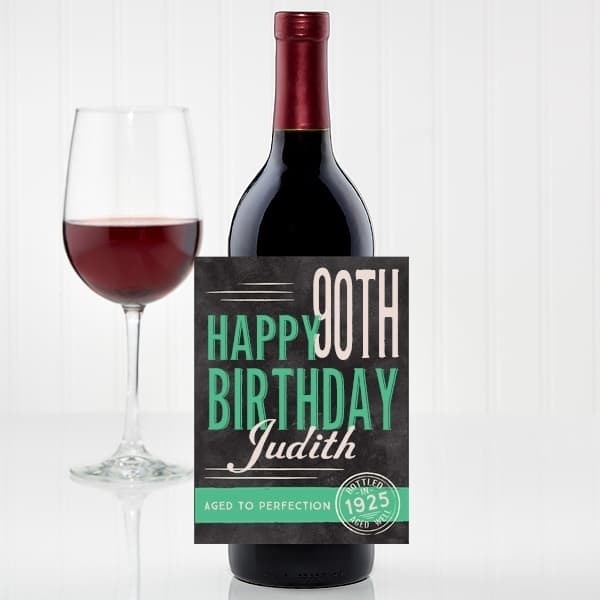 Treat your favorite senior to a memorable bottle of wine to celebrate turning 90! Even the most ordinary wine becomes special when you add a personalized wine label. Waterproof label can be personalized with their name, birth year, and 2 lines of text. Just peel and stick to any bottle of wine to create a memorable gift! 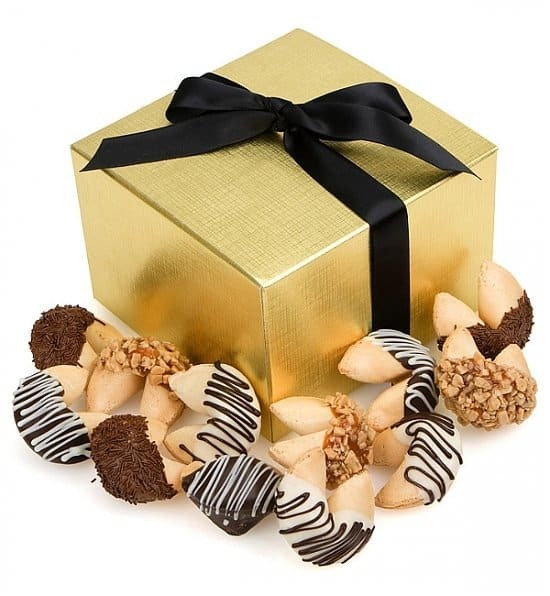 For good fortune and flavor, this gourmet gift is filled with 12 fresh-baked fortune cookies that are hand-dipped in premium Belgian chocolate and topped with delicious bits of almonds, toffee, sprinkles and more. 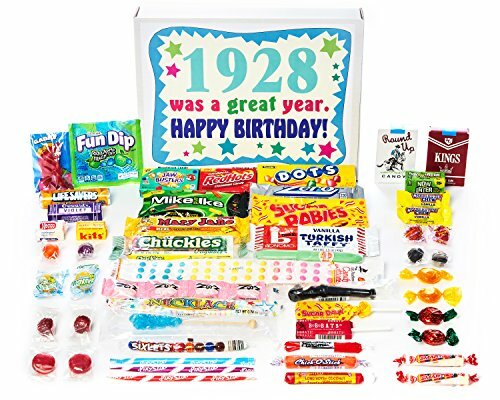 Since they are individually wrapped to ensure their freshness, the birthday star can take their time and savor every bite. Packaged within a golden gift box, the cookies feature cheerful birthday sentiments that are sure to create those smiles you know and love. Share your loving thoughts – and a favorite photo – in one sentimental gift! 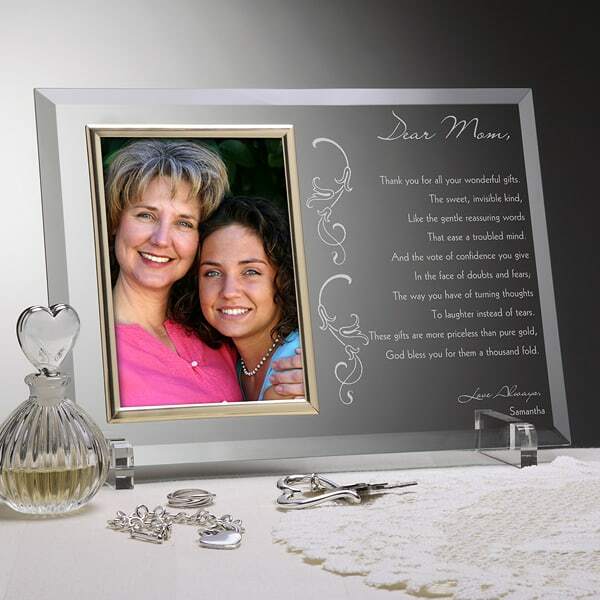 Striking glass frame is personalized with any title at the top, and then features a poem or letter that you can use to express your love and affection. Choose from 6 pre-written verses, or write your own. Add your own 2 line closing sentiment to finish the gift. Also available in a more masculine style – click here to see the manly version. This keepsake pillow is the perfect gift for someone celebrating 90 years of life and love. From children’s births to family vacations, your loved one will forever cherish this gift of remembrance. 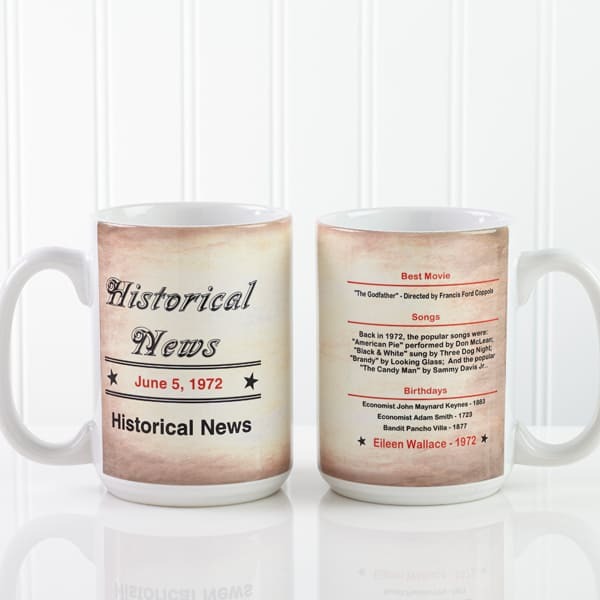 Serve up a little history with your coffee or tea! Antiqued-looking mug features the recipient’s birth date and 1 line of personalization on the front. The back is customized with their name, and details the most popular movies and songs of the day. It also highlights the names of celebrities who share this birth date. Priced at under $15, this makes a fun little gift for any senior! 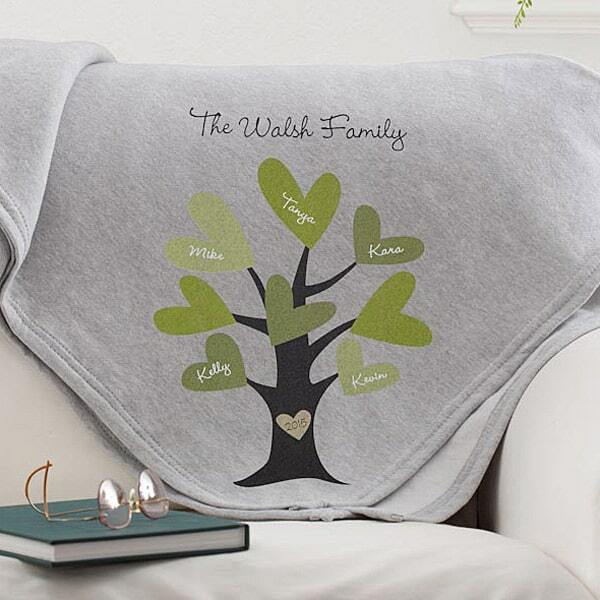 Stylish enough to adorn a couch and functional enough to cuddle in, this cozy sweatshirt blanket can be customized with 8 names, terms of endearment or other meaningful words. Featuring heart-shaped leaves, this thoughtful gift lets everyone know that your family tree was sprouted in love. Highlighting your family’s name at the top, it is constructed of high-quality and durable jersey fleece that is perfect for every season. 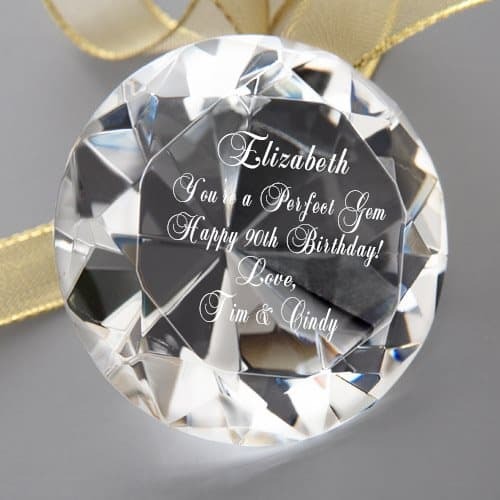 Shimmering crystal diamond-shaped keepsake is a unique way to let someone special know what a gem you think they are! 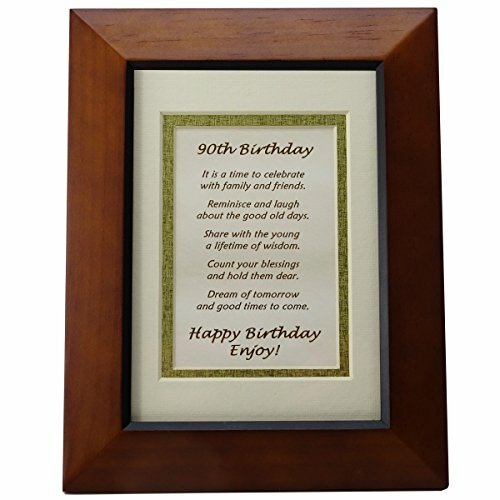 Unique 90th birthday gift is engraved with the recipient’s name, a 3 line message, and a closing sentiment or date. 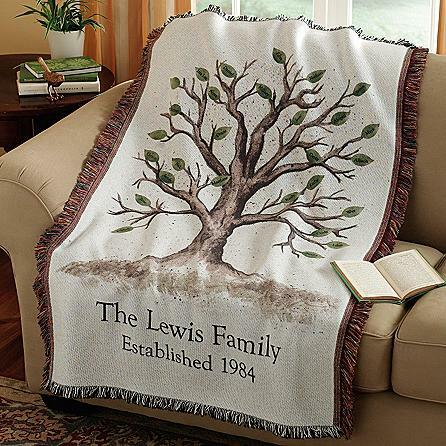 Ideal for furniture or wall decor, this oversized throw highlights your family tree in a unique and personal way. Featuring a 1-line message and a year, you can include up to 24 names to fill the leaves. Having played an important role in your family’s establishment, your loved one will cherish the stylish representation and visual reminder of the family members they hold so dear. Are you wondering what are the traditional 90th birthday gifts? Traditional birthday gifts such as flowers, jewelry and chocolates are great – but find out how you can easily tailor them for a 90th birthday! The idea of official gemstones, gifts, flowers and colors is actually associated with anniversaries (for a 90th anniversary, the recommended gift is engraved marble or granite). This tradition does not carry over to birthdays, however. There is not an official list of 90th birthday presents, colors, or gemstones. So you can choose any present you want without having to worry about keeping to a tradition. 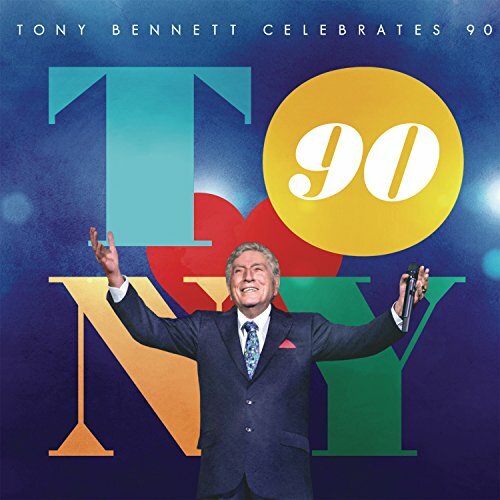 The question becomes, what’s a memorable gift that you can get someone who’s turning 90? Food is always an important part of any celebration, and a 90th birthday is no exception. Consider making a special treat or meal for your favorite senior. Are you famous for your homemade pies, fudge, or another delight? I’m sure the birthday celebrant would be delighted to be given your speciality! Gift baskets are very popular picks for any birthday. You could make your own and fill it with home-made treats or gourmet goodies. Check out your local World Market or gourmet food store for unique snacks and treats to add to your basket. You could do a themed basket if you’d like. For a coffee-lover, add a 90th birthday coffee mug, a few flavored coffees, biscotti or cookies, and you’ve created a sure-to-please gift basket. Other popular themed baskets include chocolate, champagne or wine, pasta, breakfast basket, or a pampering spa gift basket. 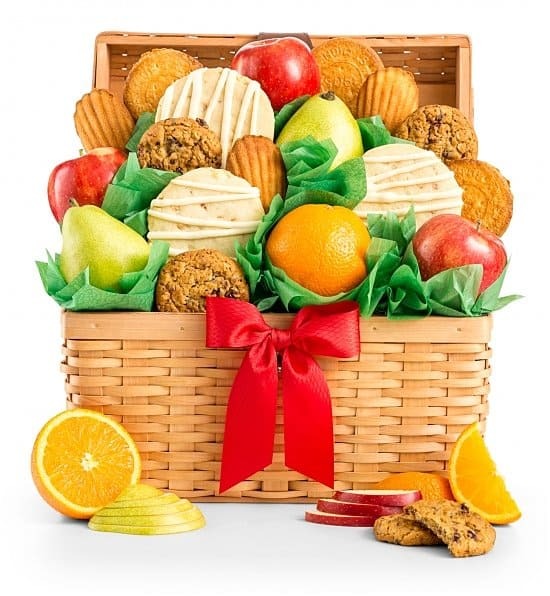 If you’re ordering a gift basket online, check out the selection of birthday gift baskets at GiftTree. They specialize in upscale gift baskets and towers, with their prices starting at under $25. If you’d like, you can add a personalized ribbon with your own unique birthday message to many of their baskets. Personalization makes even the smallest, most ordinary gift into a one-of-a-kind present that lets the recipient know that you’ve made an effort to create a unique gift just for him or her. 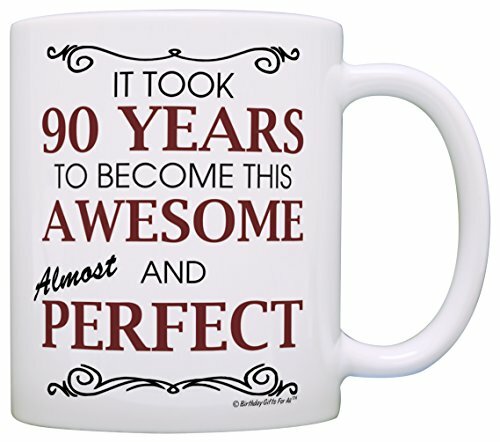 For a milestone event like this, look for gifts that can be personalized to say Happy 90th Birthday. The gift will then be a thoughtful reminder of their special occasion. My first choice for personalized birthday gifts is Personalization Mall. 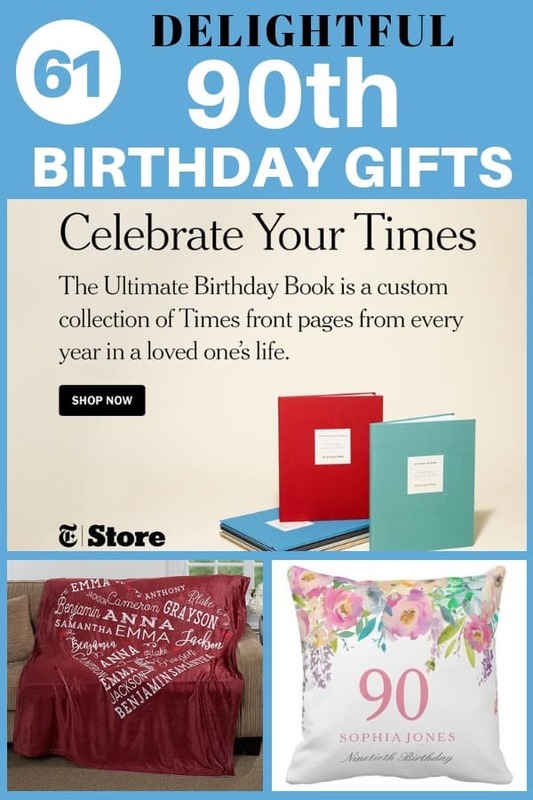 They feature a fabulous assortment of unique gifts that can be custom made (many times in just 1 day) just for this special birthday. 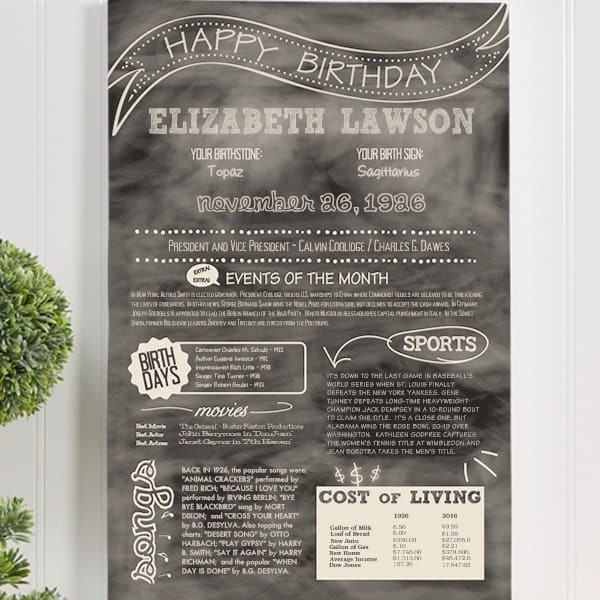 Some of their most popular milestone birthday gifts include frames, coffee mugs, and ​The Day You Were Born canvas. With prices starting at under $15, you can find a personalized gift to fit any budget. If the birthday man or woman is someone you’re close to (such as a parent or grandparent, or a life-long friend), then this is the perfect occasion to let them know how much they’ve meant to you over the years. He or she will be honored and thrilled to know that they’re made a difference in your life. Consider giving a sentimental keepsake that can be personalized with a poem or letter that expresses your gratitude or love. Personalization Mall offers an exceptional variety of keepsakes and jewelry or valet boxes that can be personalized with your own sentimental message. If you’re trying to think of just the right words to express your feelings, here’s a tip: Most of their gifts offer a variety of pre-written poems and messages that you can either use as is, or adapt for your own purposes. Just go the product detail page to see the poems and verses. You can also change the title on any of their gifts, so if you like the looks of the “Dear Mom” keepsake or the “Dear Dad” valet box, you can change the title on the gift to anything you’d like. Most seniors take enormous pride and pleasure in their family, so a gift that features the names of their loved ones is always a big hit. Look for family tree gifts, such as blankets, wall art or family tree sculptures that can be personalized with the names of all their family members. The celebrant will love being reminded of his or her loved ones. For women, family tree necklaces are a popular choice. A necklace is a great way to combine her love of jewelry with her love of her family! Anyone who’s turning 90 probably has loads of pictures lying around somewhere. 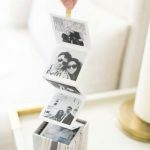 Turn those pictures into a gift such as a coffee mug, blanket, or canvas that will allow them to enjoy seeing the faces of the people that they love any time they want. You could also create a scrapbook or photo album filled with memories from throughout their lives. 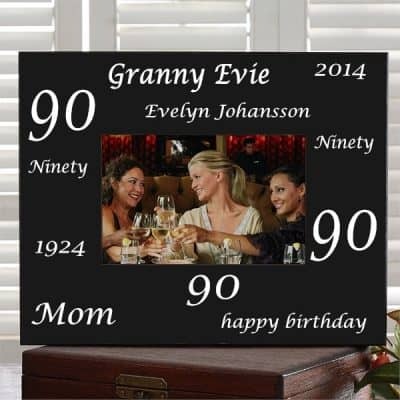 Or give an album or picture frame that’s devoted especially to the events of their 90th birthday celebration. If you’d like to use pictures from their childhood, you can easily scan pictures into your computer and then use those pictures to create gifts online. If you don’t have a scanner, check out your local drug store, WalMart or Target. They almost have scanners that you can use to upload your pictures to a flash drive or disk to restore to your computer. Also, use email, Facebook or other social media to solicit pictures from family members and friends. I certainly hope that your favorite senior is in good health and able to enjoy his or her birthday, but that’s not always the case. What should you get the man or woman who’s in a nursing home or is otherwise not in great health? If he or she still enjoys food, a gift basket or a homemade treat would be a welcome gift. Soft and cozy blankets, especially ones with a family tree or family names upon on them, can be used to keep warm. They also make great decorations when spread over a chair or sofa. A photo album filled with pictures of family and childhood friends is a thoughtful gift that they can enjoy after their birthday is over. 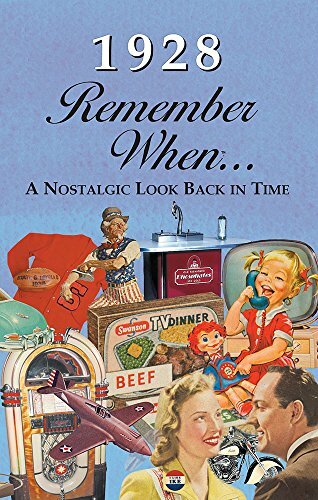 Sometimes seniors who are struggling with memory loss can recall long-ago events more vividly than day-to-day happenings. 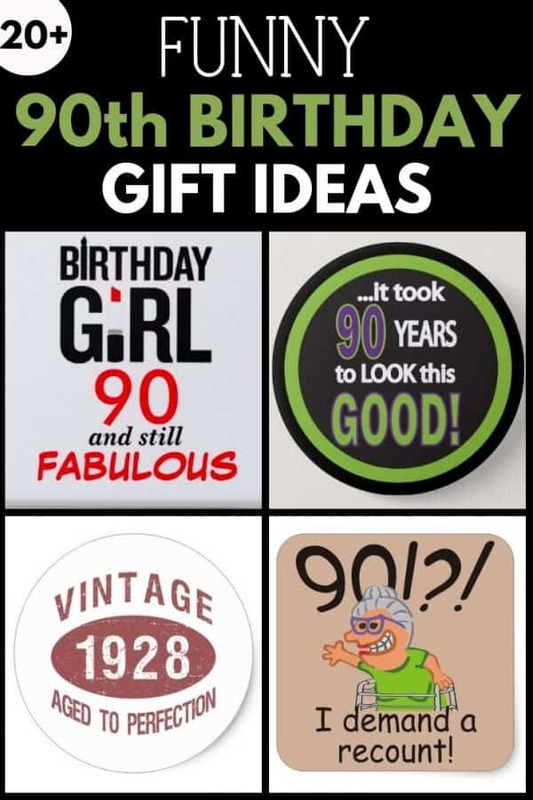 If he or she is not as aware of their surroundings, but you’d still like to acknowledge their birthday, consider a 90th birthday balloon for their room or cheerful 90th birthday stickers to adorn their outfit or door. Are you the crafty sort? Then consider making a special gift for your favorite senior – it’s a gift of love that he or she will treasure! If you’re a seamstress, consider making a memory quilt out of old t-shirts (you can find easy instructions here). A photo collage or display of some of their favorite pictures is a gift that they’ll treasure. Check out the unique family tree photo display here – it would be easy to change pictures or add new pictures whenever you want. The gift that most seniors would value the most is probably time with you. Many seniors are lonely or not as mobile as they used to be. A senior like this would enjoy spending quality time with you. If he or she is mobile, consider taking them on a special outing to a museum, play or restaurant. If they’re able and you can afford it, plan a special trip or vacation. See if there’s anything on their bucket list that they would like to do. Or offer to bring them a meal or spend time doing a jigsaw puzzle or playing cards or a game. Do a beer tasting, have a tea party, or do a craft together – the possibilities are almost endless! Enjoying time together will create memories that you will both treasure far beyond a physical gift.